Children were baptized very soon after birth. The baptism generally occurred in a church and was performed by a priest, unless there were some extenuating circumstances. Holy (or blessed) water from the baptismal font was poured over the baby's head. The child is generally names for a saint. Generally there was a godfather and godmother. 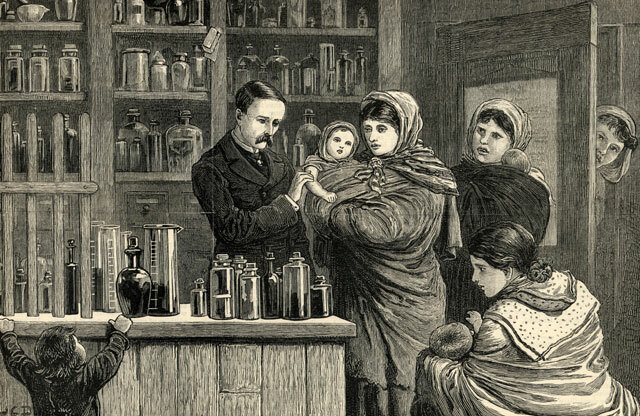 I have found few images of Irish infants and none of baptisms. The above image from the London Graphic, is very interesting. It is entitled A VACINATION STATION IN CONNAUGHT, IRELAND and is dated December 18, 1880. Unfortunately, the seller did not have the article that went with the picture. Marriages were most frequently arranged. Matchmaking was the "prerogative" of the parents. 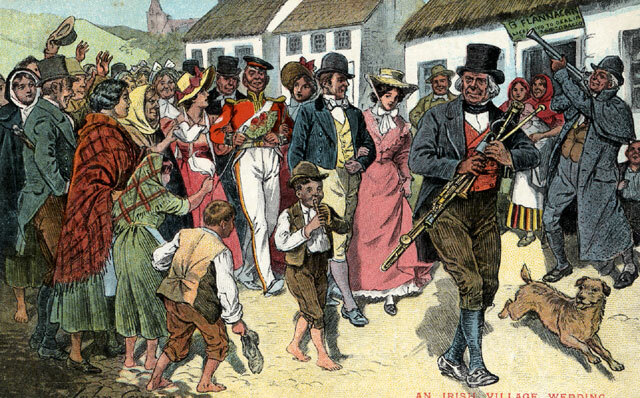 "From time immemorial a strange wedding custom has been observed in the West of Ireland, young men- known as the Straw-Boys- who have not been invited to the ceremony, and who care to present themselves in the disguise shown in our picture, being allowed to join in the festivities and control all the arrangements for a couple of hours." Drawn by E. A. Morrow. 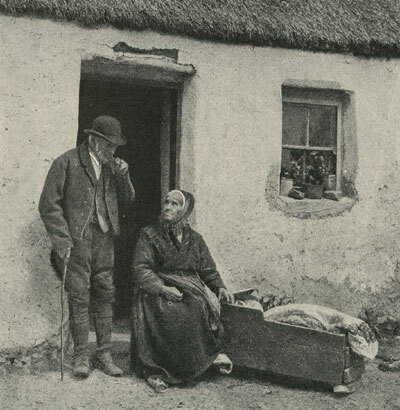 Straw-boys activity occurred mostly in the west of Ireland. 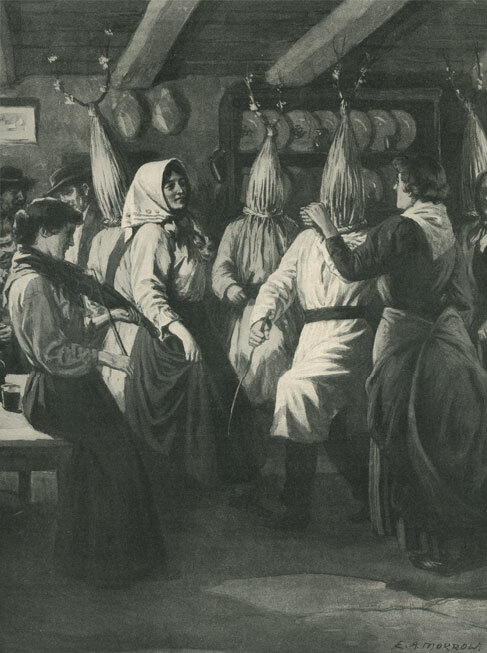 Groups of revelers wearing pointed top hats, masks, and skirts of straw arrived uninvited at wakes and weddings where they sang, danced, played music and games and generally performed acts of buffoonery often of a risque sexual nature. They were welcomed because it was believed that they brought good luck to the families involved. The entertainment value was probably considerable. The masks and outlandish attire was supposed to hide the identity of the individual and allow complete freedom from his inhibitions. However, I would imagine that in the small rural environments where these festivities were most popular everyone would have pretty much known everyone else and this was a case of who was kidding whom. Until 1972 when a law was passed that both men and women could not wed until the age of 16, Irish females could legally be wed at age 12 and males at age 14. 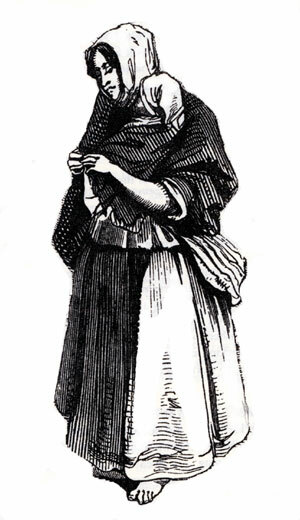 While most women married around the age of 20, pre-famine brides were often younger. May God be with you and bless you. May you see your children's children. May you be poor in misfortunes and rich in blessings. May you know nothing but happiness from this day forward. 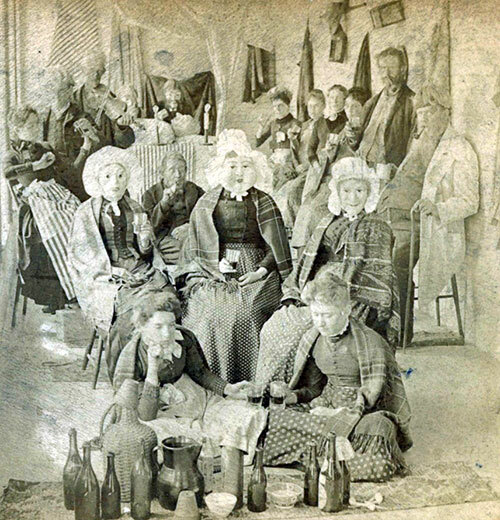 Families were frequently multi-generational. The aged could care for the infants while the middle generation worked at the hard labor. The following description of the death of one of the Kilmartin sons is taken from the novel The Famine by Liam O'Flaherty (1979) which was set during the great famine of the mid 1800s in the west of Ireland. Liam O'Flaherty was born on the Aran Islands in 1896. The sick man, who had been wasting to a skeleton for the past month, had at last reached his end. Even so, he found it hard to died. After the last rites of the church had been administered and he had resigned himself to his fate, he struggled on through the night, fighting grimily. Dawn was breaking before he died. The copper coins were placed on his eyelids and the death wail began in the house. Kate Heron took charge of the mourning. She led Maggie for the death-bed to the hearth and put her sitting on a stool in the chimney corner. Then she herself squatted on the floor before the fire, surrounded by a group of neighbour women, who drew their skirts over their heads. Kate sprinkled ashes on the women's heads and began to recite the death chant. She bent forward until she was almost prone, with her hands stretched towards the fie. Her body, forward from the hips, then broke into movement, miming the tortures of the human soul, as it struggles to break free form its prison in the human body. Her back twisted slowly, like an animal with a broken hip dragging itself along the ground. Her hands and arms also twisted, as if she were kneading breads in the air. She raised her shoulders as her hand reached outward, urging forth the spirit, miming the act of birth. "God of glory! Have mercy now and open your gates." "Amen!" said the other women. "We"ll go now and lay out the corpse"
The corpse was laid out in the corner of the kitchen where the pigs' bed had been. For that an extra table had to be borrowed from a neighbour, together with forms of seating the visitors. By the time all had been prepared, Martin returned from the village with the pipes and tobacco. The old man sat near the head of the corpse and filled the pipes, which he passed around among the mourners. The wake had begun. As people entered the kitchen, they blessed the house in a whisper, knelt before the corpse in prayer and then sat down for a while. The men smoked a little . They talked in low voices about ordinary things. It was contrary to the etiquette to refer to the cause of their presence. When leaving, however, they waited in the yard until they met one of the family, when they tendered regret in a formal manner. It was all very ceremonious. In the afternoon, Tom Gill, the cooper, began to make the coffin on the rock where the oats had been threshed. Then the keg of whiskey was broached and the wake became livelier. By nightfall the house as crowed and there was even an atmosphere of gaiety. That was proper and according to custom. Roberts' semi-monthly magazine, Volume 1 1841 had these comments and more on the traditional Irish wake. 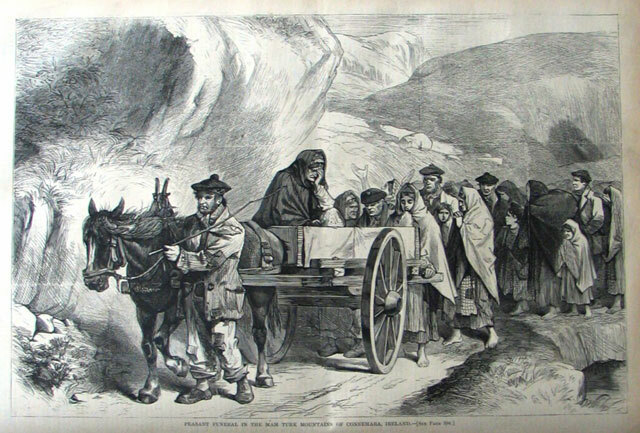 The most anxious thoughts of the Irish peasant through life revert to his death; and he will endure the extreme of poverty in order that he may scrape together the means of obtaining "a fine wake" and a "decent funeral." He will, indeed, hoard for this purpose, though he will economise for no other; and it is by no means rare to find among a family clothed with rags, and living in entire wretchedness, a few untouched garments laid aside for the day of burial. It is not for himself only that he cares; his continual and engrossing desire is, that his friends may enjoy "full and plenty" at his wake; and however miserable his circumstances, "the neighbors" are sure to have a merry meeting and an abundant treat after he is dead. His first care is, as his end approaches, to obtain the consolations of his religion; his next, to arrange the order of the coming feast. 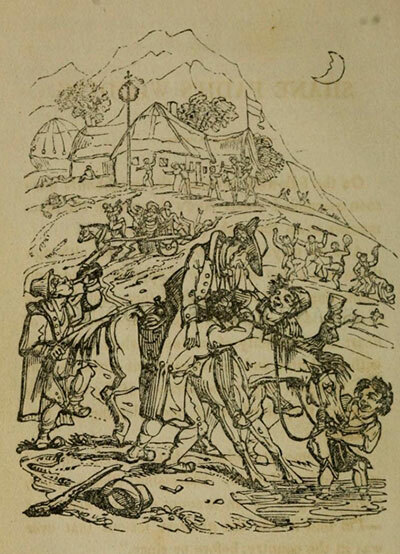 To "die without the priest" is regarded as an awful calamity. We have more than once heard a dying man exclaim in piteous accents, mingled with moans - "Oh, for the Lord's sake, keep the life in me till the priest comes!" 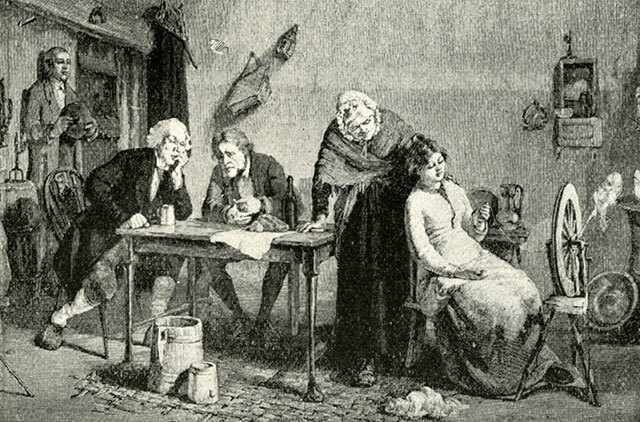 In every serious case of illness the priest is called in without delay, and it is a duty which he never omits; the most urgent business, the most seductive pleasure, the severest weather, the most painful illness, will fail in tempting him to neglect the most solemn and imperative of all his obligations-the preparing a member of his flock to meet his Creator. When the Roman Catholic sacrament of extreme unction has been administered, death has lost its terrors- the sufferer usually dies with calmness, and even cheerfulness. He has still, however, some ef the anxieties of earth; and, unhappily, they are less given to the future destinies of his family, than to the ceremonies and preparations for his approaching wake. The formalities commence almost immediately after life has ceased;. The corpse is at once laid out, and the wake begins: the priest having been first summoned to say mass for the repose of the departed soul, whicn he generally does in the apartment in which the body reposes! It is regarded by the friends of the deceased as a sacred duty to watch by the corpse until laid in the grave; and only less sacred is the duty of attending it thither. The ceremonies differ somewhat in various districts, but only in a few minor and unimportant particulars. The body, decently laid out on a table or bed, is covered with white linen, and, not unfrequently, adorned with black ribbons, if an adult; white if the party be unmarried; and flower, if a child. Close by it, or upon it, are plates of tobacco and snuff; aiound it are lighted candles. Usually a quantity of salt is laid upon it also. The women of the household arrange themselves at either side, and the keen (caoinej) at once commences. They rise with one accord, and moving their bodies with a slow motion to and fro, their arms apart, they continue to keep up a heart-rending cry. This cry is interrupted for a while to give the ban cuointhc (the leading keener,) an opportunity of commencing. At the close of every stanza of the dirge, the cry is repeated, to fill up as it were, the pause, and then dropped; the woman then again proceeds with the dirge, and so on to the close. The only interruption which this manner of conducting a wake suffers, is from the entrance of some relative of the deceased, who, living remote, or from some other cause, may not have been in at the commencement. In this case, the ban caointhe ceases, all the women rise and begin the cry, which is continued until the new-cemsr has cried enough. 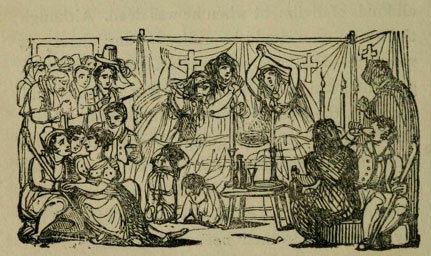 During the pauses of the women's wailing, the men, seated in groups by the fire, or in the corners of the room, are indulging in jokes, exchanging repartees, and bantering each other, some about their sweethearts, and some about their wives, or talking over the affairs of the day - prices and politics, priests and parsons, the all-engrossing subjects of Irish conversation. 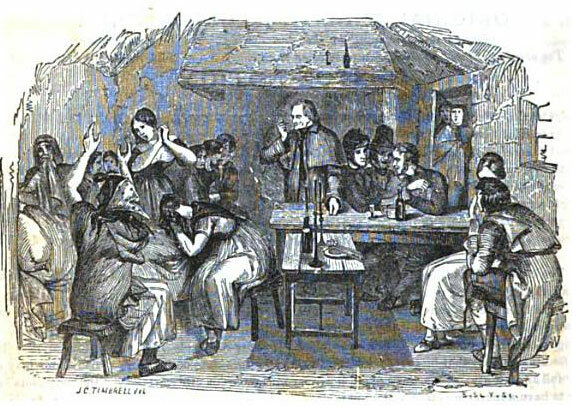 A very accurate idea of an Irish wake may be gathered from a verse of a rude song, It is needless to observe that the merriment is in ill keeping with the solemnity of the death chamber, and that very disgraceful scenes are or rather were, of frequent occurrence; the whiskey being always abundant, and the men and women nothing loath to partake of it to intoxication. The keener is usually paid for her services-the charge varying from a crown to a pound, according to the circumstances of the employer. The funerals are invariably attended by a numerous concourse; some from affection to the deceased: others, as a tribute of respect to a neighbor; and a large proportion, because time is of small value, and a day unemployed is not looked upon in the light of money lost. No invitations are ever issued. Among the upper classes, females seldom accompany the mourners to the grave; but among the peasantry the women always assemble largely. 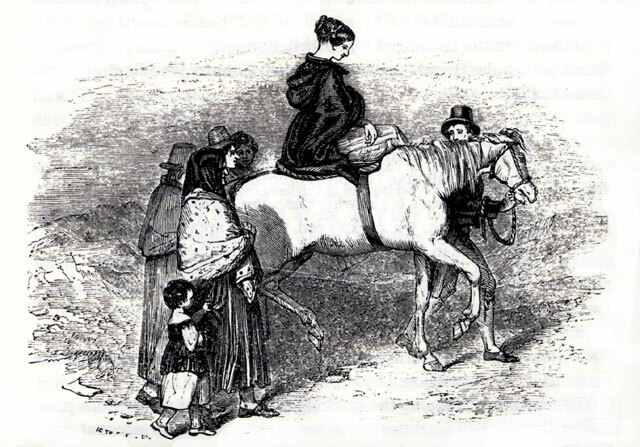 The procession, unless the churchyard is very near, (which is seldom the case) consists mostly of equestrians-the women being mounted behind the men on pillions; but there are also a number of cars, of every variety. The wail rises and dies away, at intervals, like the fitful breeze.- On coming to a crossroad it is customary, in some places, for the followers to stop and offer up a prayer for the departed soul; and in passing through a town or village, they always make a circuit round the site of an ancient cross. 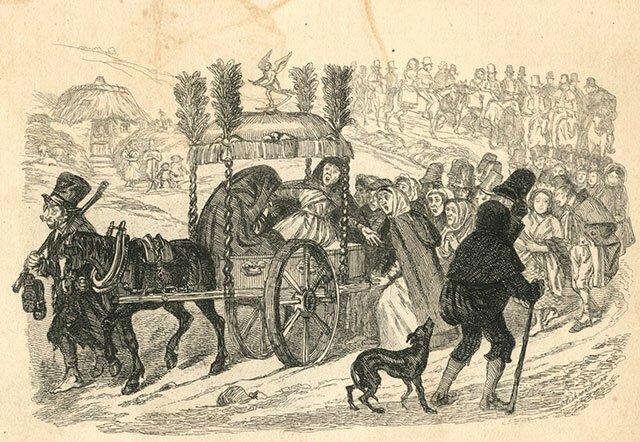 In former times the scene at a wake was re-enacted with infinitely less decorum in the church-yard; and country funerals were often disgraced by riot and confusion. Itinerant venders of whiskey always mingled among the crowd, and found ready markets for their inflammatory merchandise. 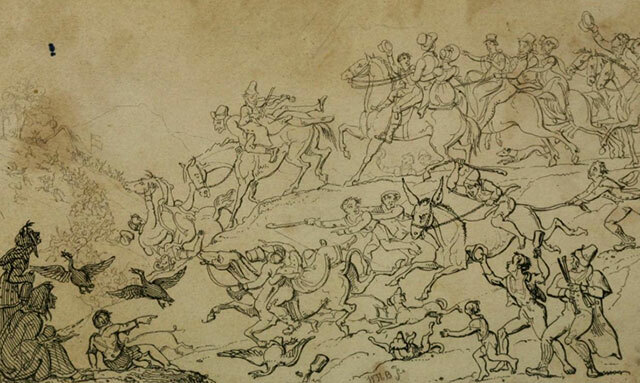 Party fights were consequently very common; persons were frequently set to guard the ground where it was expected an obnoxious individual was about to be interred; and it often happened that, after such conflicts, the vanquished party have returned to the grave, disinterred the body, and left it exposed on the highway. 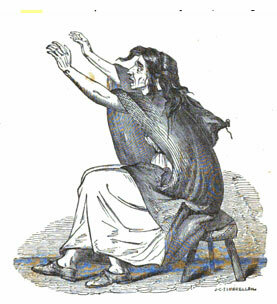 The horror against suicide is so great in Ireland, that it is by no means rare to find the body of a wretched man, who has been guilty of the crime, remaining for weeks without interment-parties having been set to watch every neighboring church yard to prevent its being deposited in that which they consider belongs peculiarly to them. Salt has been considered by all nations as an emblem of friendship; and it was anciently offered to guests at an entertainment, as a pledge of welcome. The Irish words " Caoin" and " Cointhe" cannot easily be pronounced according to any mode of writing them in English. The best idea that can be given of the pronunciation, is to say that the word has a sound between that ol the English words " Keen" and Queen." The wake lasted two to four days. The Irish America folk song "McGinty's Wake" was originally written in 1889. The song tells the tale of McGinty's ghost who fights a thief trying to steal the suit of clothes off his corpse at the wake. The song and its enactment was apparently popular in Irish American musical theater. 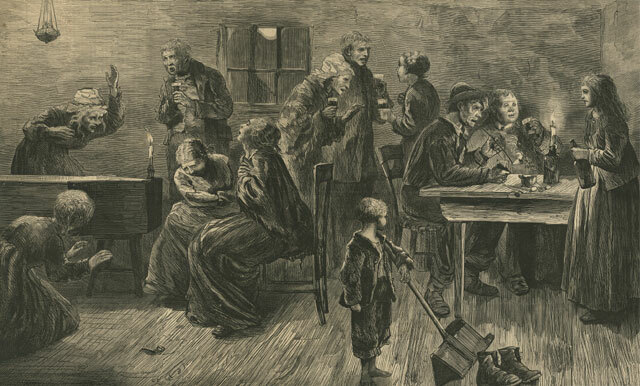 The image depicts many elements of the traditional Irish wake. The corpse is seen lying in the back middle with candles near his head. There are fiddlers to the left. In addition to the numerous bottles in the forefront almost everyone is holding a glass. Several of the men have pipes in their mouths. I do not know why the three women in the center are wearing masks. 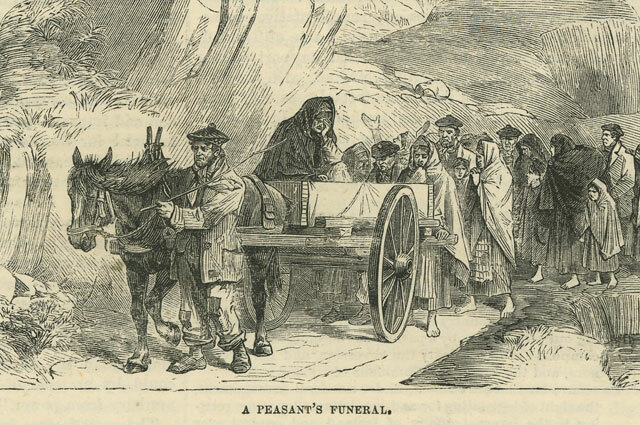 A Peasant's Funeral This is an 1880 copy of the 1870 print. The subject matter is identical in every aspect. Hand written on back in pencil "Careton Traits & Stories Irish Peasantry Tegg. Pub. ca 1885"
Chores — With IMAGES of grinding corn, cooking, spinning etc. Land Issues, Eviction, Boycotting, Murders: — — With images of evictions, boycotting, Land League issues, etc. Occupations — with images of farming, weaving, fishing, thatching, etc.